By 1975/6, aged 15/16, the DJ-ing bug bit. Another mate, Andy, had a brother who was a technical wizard with electronics and worked at the BBC, who not only built us our first DJ console but also had the pickings of the Beeb's record library. So we had the equipment and we were starting to amass vinyl too. Our first gig was at Andy's cousins flat in Lee Green, playing to a much older and sophisticated crowd, who were frequenting clubs such as the Lacy Lady and the Goldmine. They were into funk/soul and disco, but it was also at the time when Swing was pretty much in vogue too (I recall that Chris Hill was very influential in the resurgence of Glenn Miller et al). We were pretty much steered in terms of what to play that night by Andy's brother, but what a baptism. The grounding was followed by the usual gigs at mates' birthday parties, then playing at the Queens Silver Jubilee celebrations street party on a rainy day in Welling. In 1982 getting married and having the burden of a mortgage I somehow still managed to continue to buy records and DJ occasionally, but it wasn't until the 90's came around that the DJ-ing bug bit once more with a vengeance. House music was becoming more soulful as technology improved, and was sounding less clinky/clanky as more live instrumentation was being used. DJ-ing with JJ at a variety of underground parties led to meeting with promoters and forming friendships with others with similar interests. This led to playing at the Ministry of Sound, and having residencies at Katabatic in Shoreditch, and the Saint in Soho, together with regular Back to the 70's nights with the legendary Chris Hill and the 'original' mastermixer Froggy. In 2001 I was fortunate to play at Bora Bora Beach Bar, El Devino and China Whites in Ibiza. 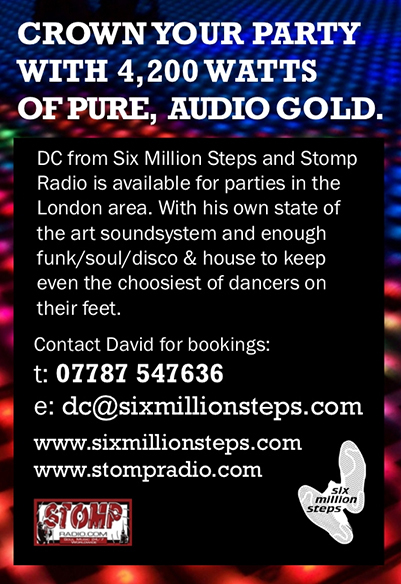 You can find me alongside my other 6MS cohorts JJ and Andrew presenting the 6MS SESSIONS, every Saturday from 11am to 1pm (GMT) on Stomp Radio.